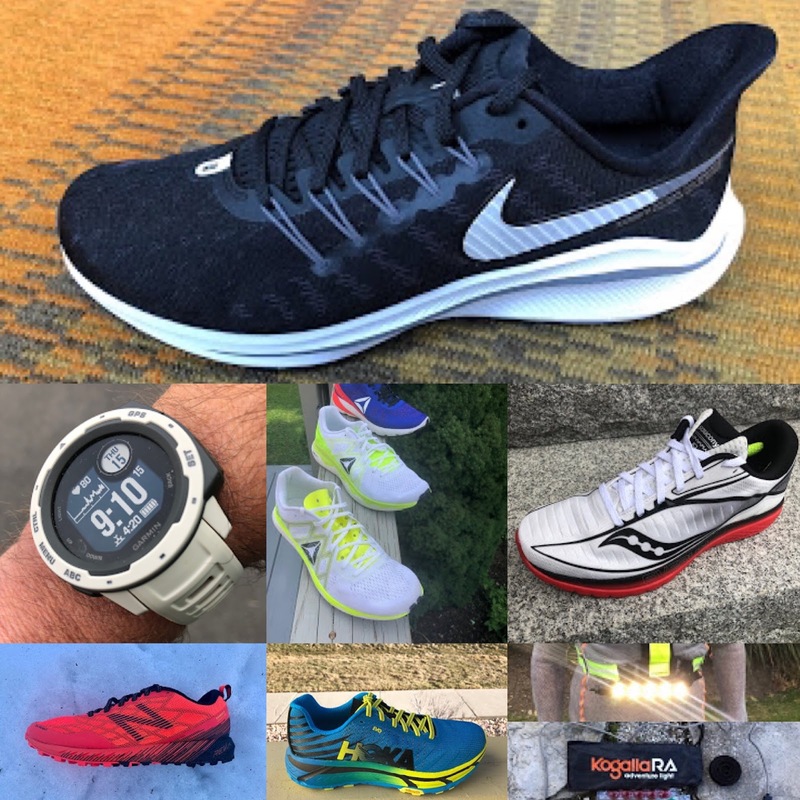 Editor's Note: RoadTrailRun is offered products to test and review and more frequently reaches out to companies to test products which intrigue us. Not everything we receive ends up being featured or reviewed. We test and ponder their performance and utility before deciding or not to include them in our articles. We receive commissions from purchases at the links below. Jeff: Not falling into the typical running gear category, we were approached by Stanley to review some of the latest Vacuum bottles, one with the newest Ceramivac technology. Though not a running product, I find these bottles to be essential gear much of the year. The majority of my runs require driving 10 or 15 minutes to a trailhead and during the warmer months, I find it to be essential to have cold water after a run. With normal bottles, water is hot enough to make tea if left in the car for just an our run and is virtually useless for drinking, however, these Stanley Vacuum bottles keep water icy cold for for a long period of time up to 2 or 3 days in my experience (Stanley claims 50 hours, which I find to be accurate). I also use them in the cold of Winter, to keep my water from freezing in the car when the temperatures are below freezing. The 64oz Classic Vacuum Growler $65 - is amazing if I need to bring enough water for a full day and share with the family on a trip or after a long hike. It is a bit heavy for bringing along on a hike, but ideal to keep in the car for a larger well of cold water. The double wall stainless vacuum design is wonderfully efficient and maintains great tasting water no matter what. The 64oz. growler is very well built and durable. The 36oz. Go Bottle with Ceramivac $40- This BPA free Ceramivac coating over double wall stainless ensures excellent insulating properties without the metallic taste some might experience with the stainless (though I have not experienced any negative tastes with either bottle). 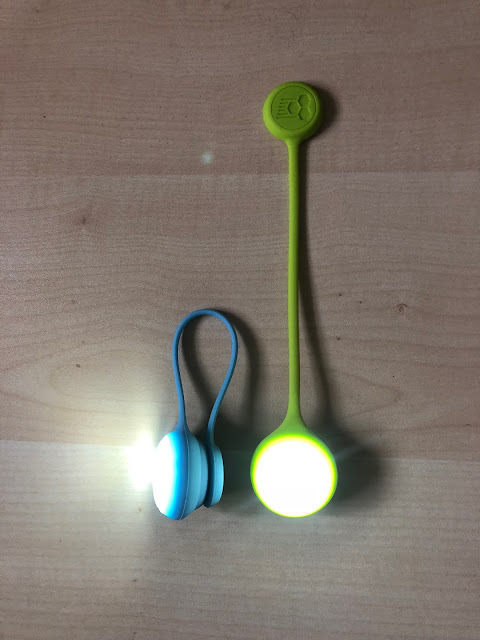 Jeff: These lights are excellent for running or cycling in fading light or dark conditions. With a magnetic end, these easily attach to clothing or a hat for a secure hold just about anywhere you want it. These lights are super light, don't bounce and with the click of one simple button, either stay steady on, or flash. 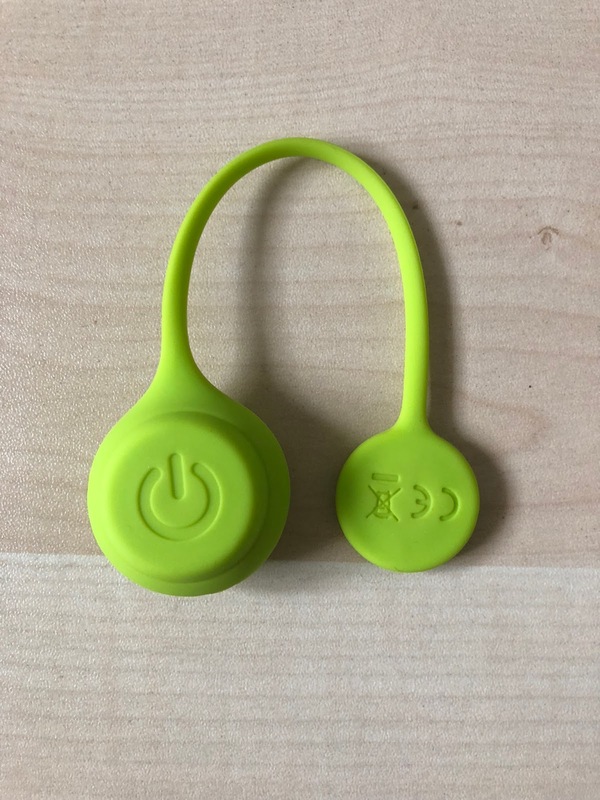 I even clip them on my 7 year old daughters during the day when biking to make them more visible (and they find them to be fun to play with any time). These run on two watch batteries, which are easy to replace and last a long time. Jeff: Kahtoola is now making gaiters in 3 different heights, low for minimal scree protection, medium for scree/light moisture and tall for snowy conditions and bushwhacking (with a Gore Tex version also. 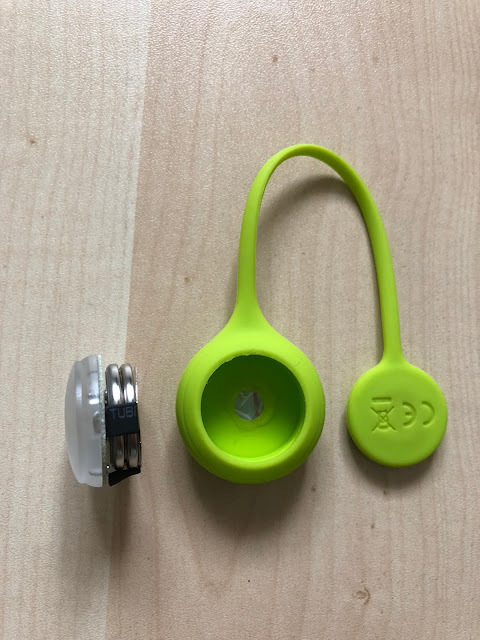 They also offer a Connect version that attach directly to Kahtoola Microspikes. The materials are light, high quality, stay in place and are easy to use. 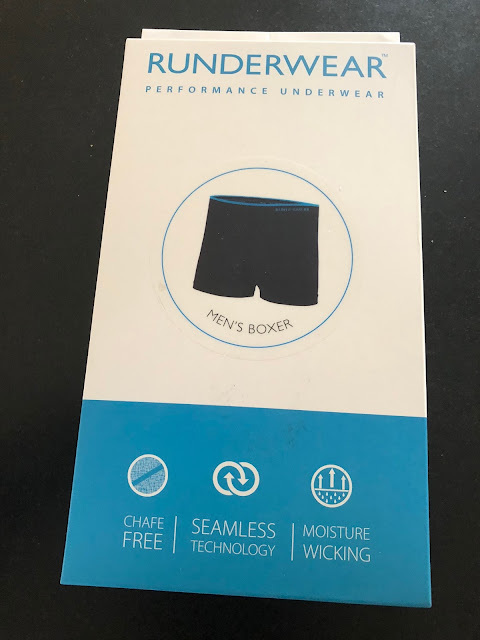 In my testing I found them all to be durable, very light and comfortable. They all perform their job quite well and we would recommend any of them depending on use/preference. Instagaiter Low - Perfect for keeping out minor trail debris, fast and light for racing, you hardly know you have them on. NAVAgaiter GTX and LEVAgaiter GTX - Made with Gore Tex and taller for snow and off trail, very light and comfortable with good protection and can be worn under or over pants. The NAVAgaiter GTX has a more durable ballistic nylon lower section for increased durability and protction. Jeff: GU has been at it for 25 years and I have been a loyal customer from the very beginning. 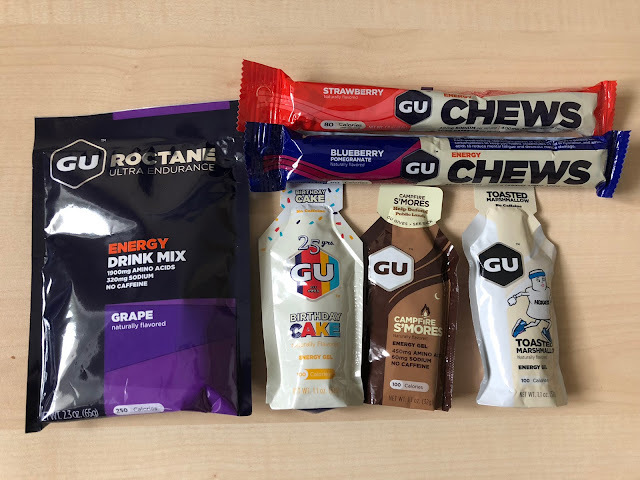 Even with various food sponsors when racing as a pro cyclist, I would purchase my own GU at full cost. Like back then, it is still the case that GU products work very well with my digestive track, as they are easy to swallow, have an ever increasing wide variety of flavors and digest quickly. To change it up on longer, all day outings, I like to alternate between gels, Chews and Roctane drink mix. The Roctane tastes great, not too sweet and goes down smooth, an easy way to take in extra calories and especially useful in the heat. Sam: I concur with Jeff on GU Gels and Chews. They are my goto for all racing. I prefer Roctane flavors but the others all are tasty as well and agree with me. I particularly appreciate caffeine flavors. In my recent Boston Marathon qualifier race I had 5 GU, each a different flavor and probably should have had a 6th! 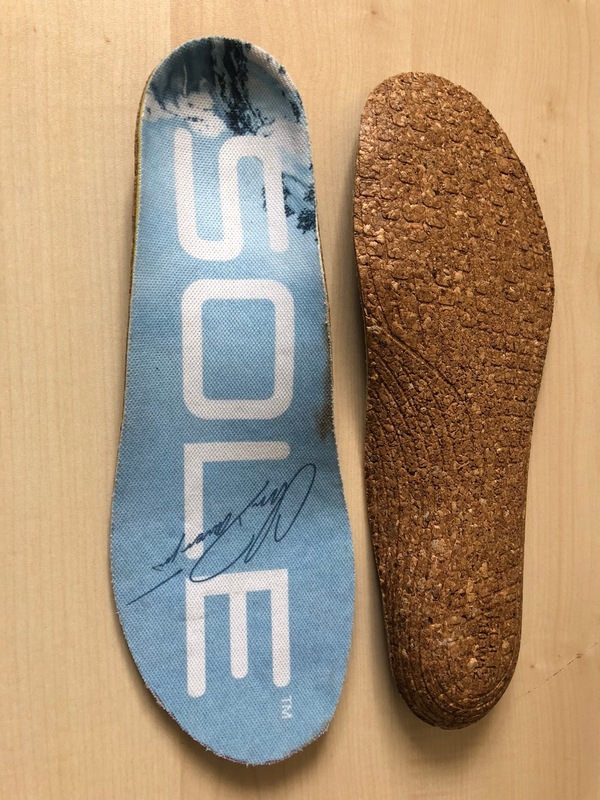 Jeff: Made from recycled cork and available in a variety of thicknesses, with and without Met pads and even in a wider version to specifically fit Altra shoes, SOLE footbeds are high quality and easily moldable for a custom fit. I would recommend them for those with foot issues and those who are specifically seeking more support than stock footbeds give, but for my preference, I have been using them in my casual day to day shoes. For running, I find that even the thin version sets my foot a bit to high in a shoe and throws off the fit and stability some. Not to mention that they add nearly 2 oz. per shoe, so something to keep in mind. Jeff: Available in no show, crew and quarter length, Balega socks have a seamless contoured fit, supportive design and made from anti microbial, blister resistant fabrics. Additionally, Balega makes their socks in the US and S. Africa, hand inspects them and recycles 50% of the water used in their manufacturing process. I have found these socks to perform very well in a variety of conditions, from warm (80's) to cold (30's), are comfortable, breathable, don't stink and so far are holding up very well. Sam: I particularly like Balega's Blister Resist Drynamix mohair synthetic blend socks. Mohair's flat structure resists sheer friction thus helping prevent blisters. The one foot feel is softer than Merino and the socks have proved very durable. Jeff : Trail Running 1/4 length turn down and Walmsley Hyper Thin. The trail running sock is a bit thicker for a touch of added cushion and protection and very well constructed. The cuff of the sock flips down for a little added relief on hot days, though the socks breath well enough, that I never feel the need. I really like the crew height to add a bit of coverage and protection. These socks are so light, the height hardly seems to be a weight penalty. 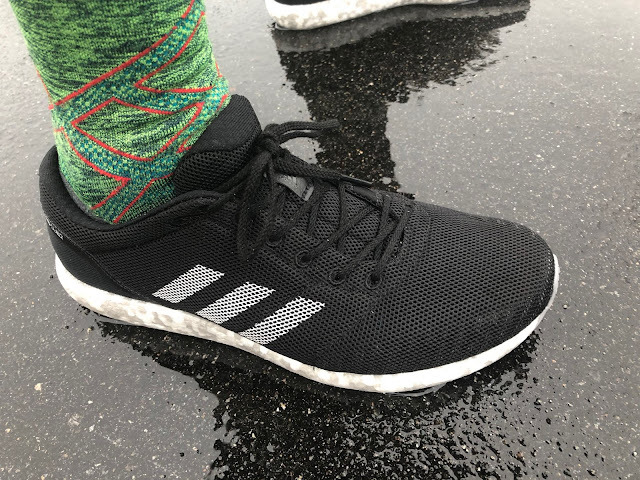 Super cool and breathable, certainly my first pick sock if I am feeling sporty and putting on my best Walmsley impersonation (OK, never even close, but it is fun to dream). Sam: Stance Socks, a personal purchase, have been my goto this spring. They have a great fit which got me through my spring marathon and almost all training completely blister free. They feature FEEL360 which as Stance says truly does adapt to movement in my experience with no binding hot spots or slippage. These relatively snug socks have various densities of knitting including some targeted compression, a breathable mesh over the top of the foot and an articulated foot bed. I have used the all synthetic Fusion Run as well as the slightly heavier wool blend Fusion Run Uncommon Solids Wool. The slightly heavier Uncommon was perfect in my Nike VaporFly for my marathon providing blister free comfort and a bit more bulk at mid foot. 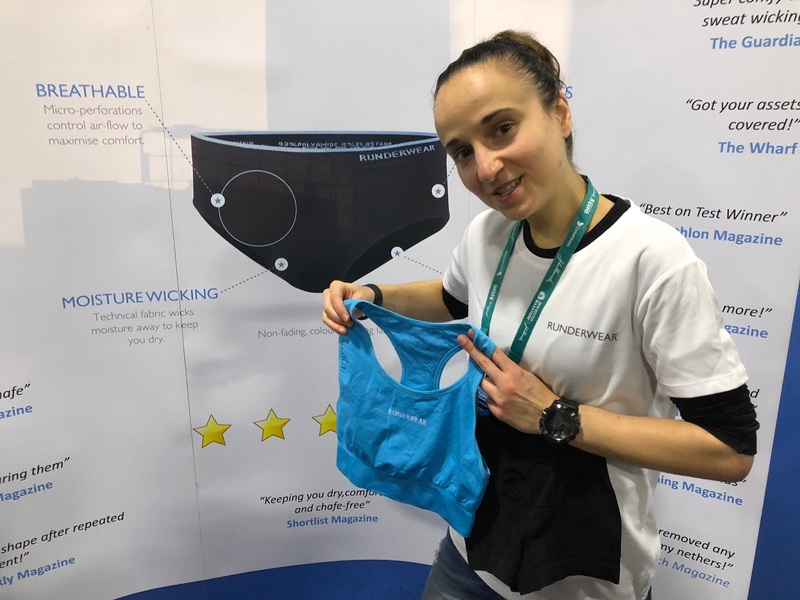 Runderwear is a UK based company which launched in the US and the Boston Marathon Expo. WE bought a pair or two. 100% dedicated to running underwear for men and women a lot of care has gone into breathability, moisture wicking and a 360 Seamless Design. The fabric is soft and somewhat more substantial than the usual super light, barely there tech underwear. 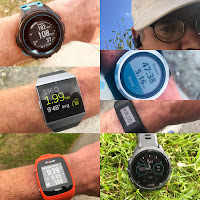 We found that extra weight and the other features provided a very comfortable, climate controlled, and non clammy and in colder temps not chilled on the run experience. Sam: The Superlite may be the first "engineered knit" hat, a now increasingly common method of constructing shoe uppers. By varying the knitting density varying levels of structure and breathability can be incorporated into the items with less waste from overlays and stitching. And why not in a hat! 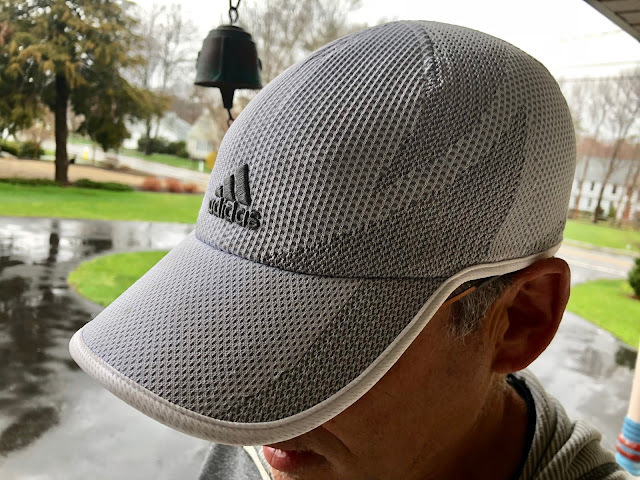 By eliminating solid panels in the front of a hat and providing more evaporative surfaces and also more sun protection than the common mesh used in the rear part of hats, the Superlite is super breathable in warm weather and even decently insulating in cooler weather often for me eliminating the need for a winter run hat. The engineered knit part is actually functional as the front sides and rear have a denser knit to provide not only visual highlights but a touch of structure. The Superlite has a dark underbid to cut sun reflections and rear velcro closure. It my go to 2018 hat for most runs. We started this round up with a growler that is a bit heavy for on the run use and we'll end it with the the to heavy for run carry immersive sounding Wonderboom. It has been a constant and entertaining companion at RoadTrailRun HQ for several months around the house and outdoors in any weather. It is waterproof so ideal for pool side or camping, and rugged. It has a 10 hour battery life and comes in all kinds of fun colors. We count eleven! 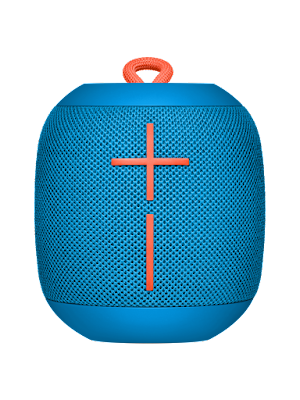 The sound quality is excellent and projects 360 degrees so perfect for the outdoors or to move around a party as we just did after showed off her baking. Jeff Valliere is a former pro cyclist who now runs and climbs the mountains of Colorado. He has been top 5 Masters, top 25 overall, at the Pike's Peak Marathon several times, finishing 2d Masters in 2015. Jeff loves vertical accumulating more than 500,000 vertical feet per year, has climbed all the Colorado 14's and 200 of the 13's and has held FKT on several. Sam Winebaum is the Editor and Founder of RoadTrailRun. He has been running trails and roads and run shoe and tech geeking for 45 years. As he turned 60 in 2017 he was thrilled to clock a 1:35.24 half as well as 2 days after his birthday a 3:40 marathon. Some featured products were purchased some were provided at no charge\. The opinions herein are entirely the author's.